•The Green Line Extension to Crenshaw Boulevard in Torrance. The Green Line would be extended for 4.7 miles from its current terminus in Redondo Beach to a new Torrance Transit Center. The opening date would be 2030-32. •There would be funding for a new light rail and bus station adjacent to LAX where Green Line and Crenshaw/LAX Line riders will be able to transfer to a people mover — to be built by LAX — that will serve airport terminals. The station would open in 2021-23 with the people mover targeted to open by 2023. •The city of Torrance would receive $2,108,700 in local return funds in the first fiscal year of Measure M. That amount would increase in subsequent years if sales tax revenues increase. These funds can be used for local transportation projects such as street repair, road/traffic light improvements and pedestrian and bike infrastructure, among other things. •Torrance Transit would receive $2,699,700 from Measure M in its first fiscal year — an amount expected to also increase in subsequent years. •There would be $250 million for improvements to the 405/110 interchange that is just east of Torrance. The project would add ramps that directly connect HOV lanes on the 110 and 405. •I-405 South Bay Curve Improvements would receive $150 million. This project would add segments of auxiliary lanes in both directions to improve traffic flow at on- and off-ramps for 10 miles between Florence Avenue and the 110 freeway. 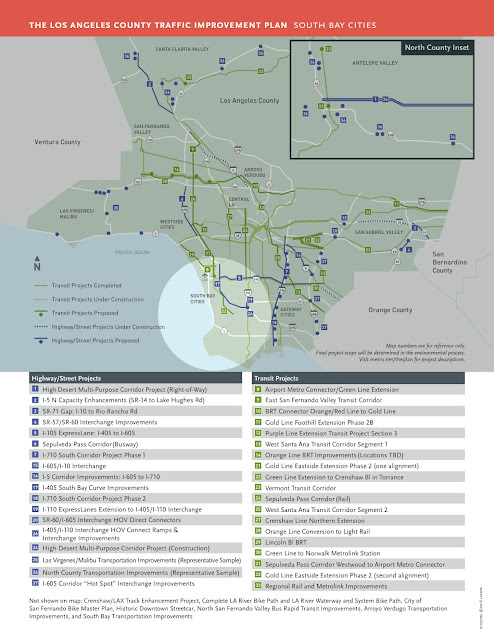 •There is also funding in other programs such as South Bay Highway Operational Improvements ($500 million of $1.1 billion total cost); Transportation System and Mobility Improvements Program ($643.5 million); Subregional Equity Program ($130 million), and; all subregions are eligible to compete for $260 million ($350 million total cost) worth of Bus Rapid Transit projects, and $858 million worth of Metro Active Transportation Projects. Measure M would increase the countywide sales tax by a half cent and extend the Measure R half-cent sales tax beyond its mid-2039 expiration date to fund a number of transit, highway, pedestrian and bike projects and programs. To learn more about Measure M, click here. To see the timeline of Measure M projects and programs, click here.